TABLE FOR TWO and Alcoa Foundation are proud to share the successes of Neighborhood Charter School of Harlem, New York, recipients of the Alcoa foundation grant; the 300 students received funding to be fed nutrient dense meals along with receiving food education to help prepare for a lifetime of healthy food choices. My scholars and I really enjoyed the food education opportunity offered to us. Our scholars were not only able to learn about nutrition and health, but also gained hands on experience they can take with them for years to come. Healthy feeding and food education just became more fun for students. TABLE FOR TWO (TFT) and Alcoa Foundation are proud to share the successes of Neighborhood Charter School of Harlem (NCSH), New York, recipients of the Alcoa foundation grant; the 300 students received funding to be fed nutrient dense meals along with receiving food education to help prepare for a lifetime of healthy food choices. In addition, they were bestowed an indoor school garden, to help them to learn where the food comes from. 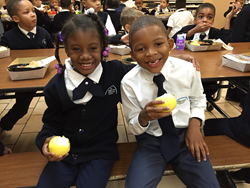 TFT supported over 300 students with fresh, daily prepared balanced school meals that included lean protein, fresh fruits and vegetables, calcium rich dairy foods, and whole grains. Food standards were re-assessed to exclude more than fifty ingredients including high fructose corn syrup (HFCS), trans fats, artificial ingredients and preservatives. To encourage meal acceptance, kid-inspired recipes were used and food education were provided to understand why it’s important to eat healthy. TFT aimed to assist schools in low-income neighborhoods that strive to provide healthy meals but also to implement curriculum work that incorporated food education into NCSH’s aftercare classrooms once a week during the school year. As part of the education format, a new vegetable was introduced each time and the students had valuable hands-on interactive learning experiences. 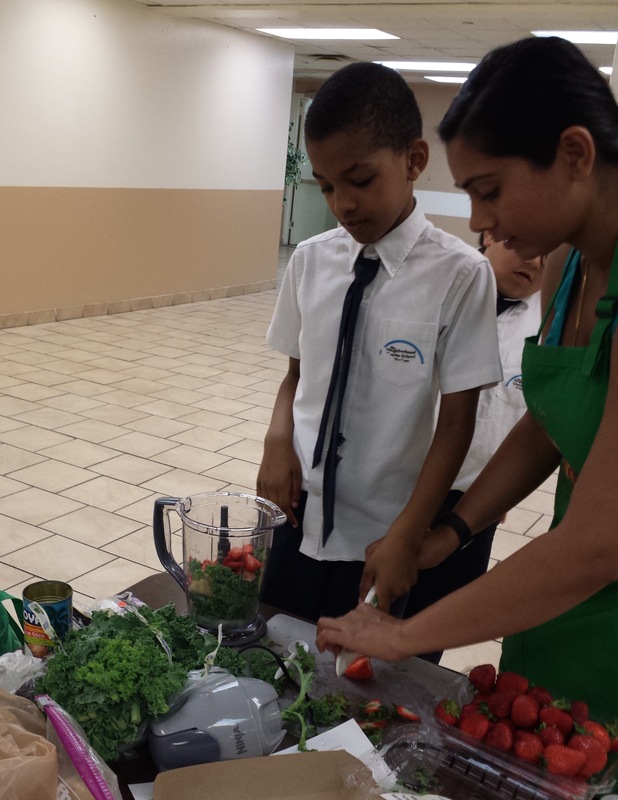 "My scholars and I really enjoyed the food education opportunity offered to us. Our scholars were not only able to learn about nutrition and health, but also gained hands on experience they can take with them for years to come." said Adrienne Hlowderski, third grade teacher. 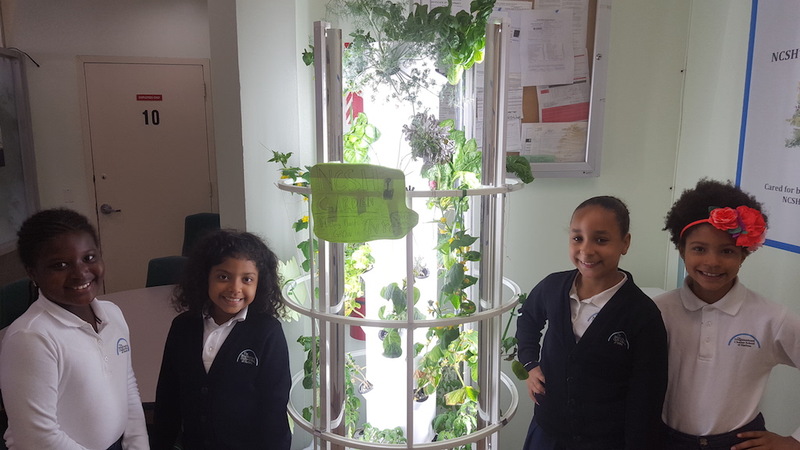 To supplement the food education, an indoor garden was provided and the students had an opportunity to grow vegetables inside the school. “Since I began working at NCSH, I have wanted a garden to introduce gardening to our scholars. One hope was to get the kids to taste vegetables straight from the plant that grew them. This garden is fabulous.” Dr. Laurie Nathan, school psychologist and also indoor garden caretaker. “Whenever I am by the garden, I am asked questions about it and my all-time favorite question is "May I taste another...?" Visit http://www.alcoafoundation.com and usa.tablefor2.org for more information about the grant and TABLE FOR TWO initiatives. In our world of 7 billion, 1 billion suffer from hunger while another 2 billion suffer from obesity and other health issues related to unhealthy eating. TABLE FOR TWO USA (TFT), a 501(C)(3) organization rights this global food imbalance. TFT partners with corporations, restaurants, schools and other food establishments to serve healthy, low-calorie, TFT- branded meals. For each one of these healthy meals served, $0.25 is donated to provide one healthy school meal for a student in need in East Africa and our local communities in the U.S. To further promote healthy eating, TFT provides food education to children around the world. Hands-on interactive food education class Our indoor school garden! TABLE FOR TWOTFT is a 501(c)(3) non profit organization with a mission to tackle obesity and hunger issues. Alcoa FoundationAlcoa Foundation is one of the largest corporate foundations in the U.S.